Located in Toronto's Little Italy, this typical “Toronto Special” semidetached house lacked the creative interior and studio space the owners desired. The client, a husband and wife team of local restaurateurs, were looking not only for a functional overhaul to the back of their house, but also a renovation that would tie in with the context of their neighbourhood. It was also important to draw from the Haitian roots of the husband, a notable Haitian-Canadian painter. The project goal was to provide a modest two-storey back addition to include a casual dining space and bedroom loft above, as well as a separate painting studio. 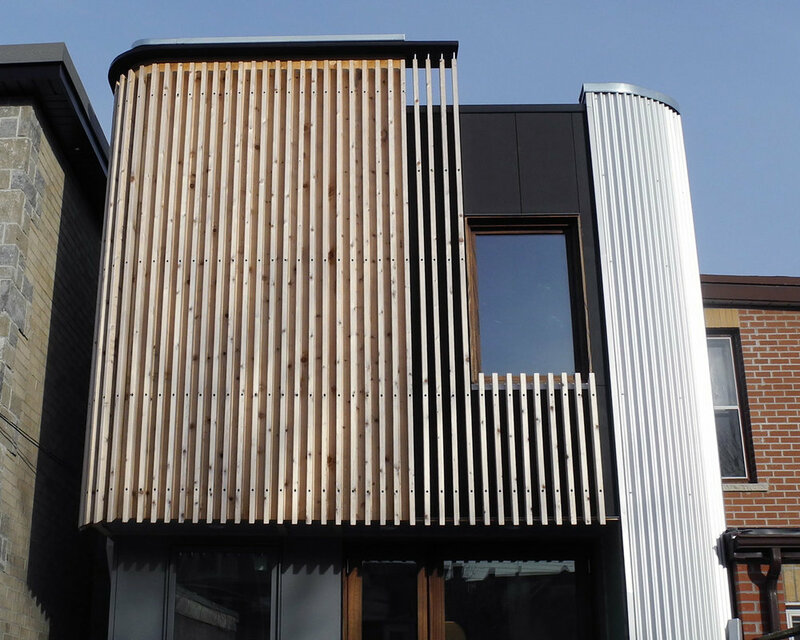 The exterior of the addition is a physical and visual response to the back-of-house condition common in dense urban neighbourhoods, where anything goes, but everything is a response to something. We see this collage of materials and chaos as something to be celebrated. The sinuous facade of the addition is clad in corrugated steel, plywood, cedar, and brick - materials that push, pull, shift, and veil in response to property lines, party wall, garden, and light well conditions of the site. On the interior, the second floor plate of the addition pulls away from the party wall to connect the loft above to the new dining space below with an art wall and fireplace. The painting studio, in lieu of a garage, addresses the laneway in a jacket of corrugated metal that reflects the harder utilitarian edge of the property, and carries the sensibility of Haitian vernacular architecture into the 'out building' building typology. The studio roof form allows for a north-facing clerestory of windows to wash the south interior wall with diffused light ideal for painting. The studio anchors the back of the site to the new courtyard nestled between the studio and the addition.